Anno – alta (a long time ago) was playable during 2004 and 2009 on http://www.anno-alta.de maybe some of you guys remeber. But due to my study i had no time to keep it running and maintain it as much as i wanted. So I decided to take it down. I still habe all the data so maybe the game will surface again some time in the future. 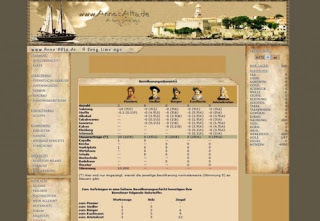 The game was a browsergame like O-Game (which was at that time (2004) the cooles browsergame … well no offence this is only my oppinion in the meantime there are better ones … again no offence^^) and based on the great PC-Game Anno 1404. Initially you had an island which you could build on … well imagine alle the anno 1404 buildings with the tabular build menu of the oldscool browsergames. Your people had needs for food, cloth … and buildings like churches and pubs. If you satisfied the needs they upgrade themselfs and had more and other need but also gave you more money. Well i just learned PHP and mysql and always wanted to create games … btw this was my very first game … i was a huge fan of Anno 1404 and in school i played browsergames when i was bored And i really enjoyed the multiplayer of Anno … i played it for hours … no days with friends on LAN.